Watching engineers turn into giddy school girls is always fun, but especially so when they’re hyped up about a mass-market compact car. 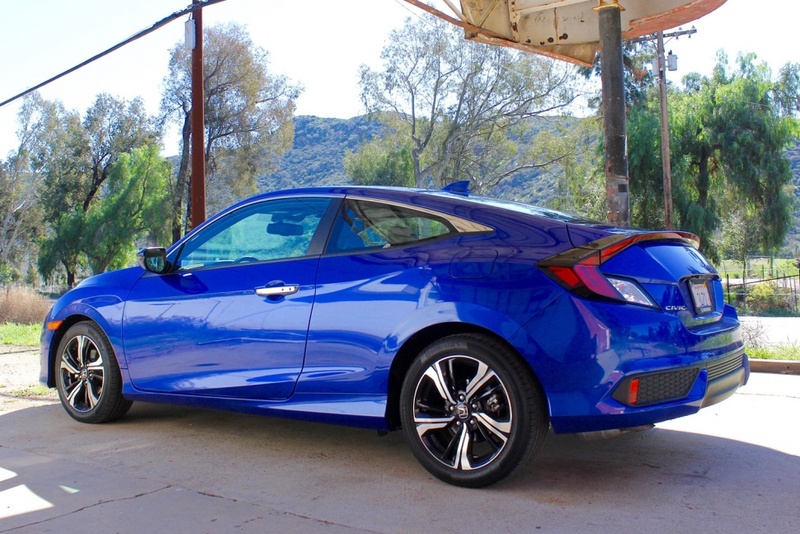 The hour-long presentation on Honda’s 6th generation Civic coupe was full of enamored verbiage from in-the-weeds project managers describing how dramatic this new Civic is compared to previous generations. Along with this was the occasional cheering from the company’s biggest fan, Honda Pro Jason. 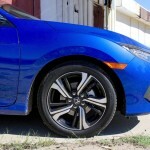 Both California and Japanese design teams came together to turn the “epic” 10th generation Civic sedan into an even more entertaining two-door. 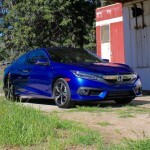 Since the first Civic Coupe rolled off the production line in 1993, Honda has sold 2 million of them, but instead of playing its greatest hits, the automaker decided to go big on the latest model, to the enthusiastic approval of its workforce. So far, that risk is paying off. 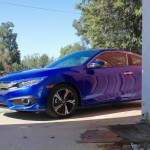 Since the four-door Civic hit showrooms this past November, it has already matched sales highs usually reserved for summer months. Winning the North American Car of the Year award hasn’t hurt the model’s public appeal either. 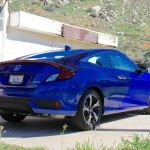 Now it’s the Coupe’s turn, the style-first configuration of Gen Y’s favorite whip. 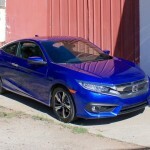 Unlike compact sedan buyers, Honda claims that coupe shoppers are sold on a car when they see it on the road, long before they take a test drive. Considering how many heads turn for the 2016 sedan, it’s no surprise that the new Civic’s flair works even better with two fewer doors. 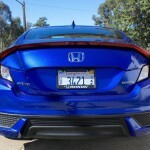 A stand-in double for the Civic Concept that debuted at last year’s New York Auto Show, the Civic Coupe adds a wrap-around LED light bar to its taillight design and tightens the rear glass and greenhouse to emphasize the car’s plump haunches. Dimensionally, the new Coupe is lower, wider, and has a longer wheelbase than the current model, with added legroom for rear passengers and a lower seating position for driver and front passenger. 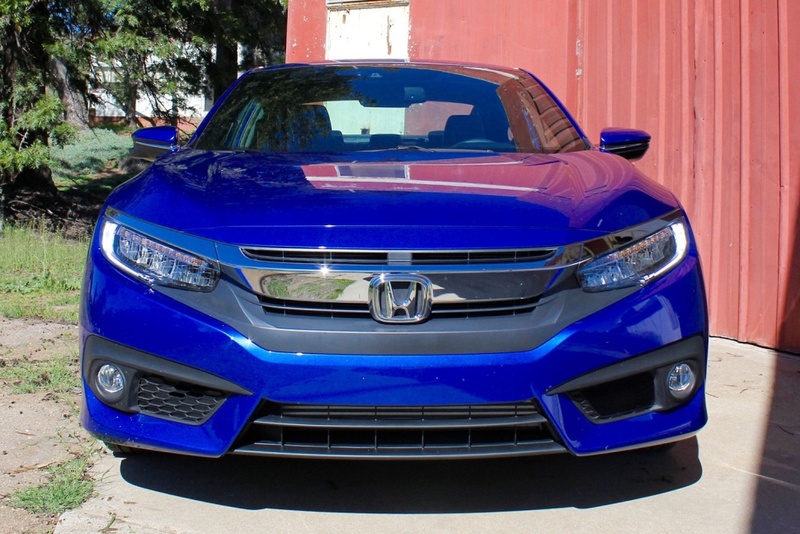 Like the sedan, the 2016 Civic Coupe’s front end is a home run. From all angles, the nose is beautifully bold, but paired with the Touring trim’s LED headlights, it’s one of best looking front fascias on the market. Moving rearwards, the silhouette creeps into hatchback territory thanks to the elevated trunk and slow-sloping roofline. Though that particular design trait might be confusing when the five-door hatch debuts later this year, it’s a unique look within the segment. Standard are 16-inch alloy wheels (the better of the two designs, in my opinion), but 17-inch rims come on EX-T and above trims. 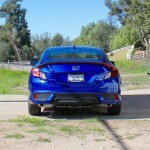 As for the rear, I actually prefer the understated looks of the current generation coupe to the rounded rump of the new. 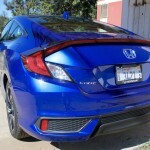 Its design melts reasonably well within the overall vehicle’s sharp stance, but the U-shaped accent on the trunk that extends from the roofline feels overdone. Honda offers eight colors for the coupe, including the two-door-exclusive Energy Green Metallic (just like the Civic Concept). For those who’d like to eventually sell their cars, however, the Aegean Blue is a more mature way to prove you have personality. I assumed there was some unwritten rule that compact coupes equated to mild forms of torture for rear seat occupants. 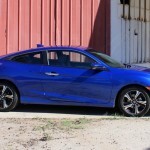 Someone forgot to share that bit of information with Honda, however, because the 2016 Civic Coupe’s backseats are more than pleasant accommodations for everyone except your in-laws. For the majority of buyers who won’t be gunning for the top-spec Touring trim, even the modestly-equipped EX-T variant is packed with technology and other goodies, while all specs benefit from a handsome, spacious configuration. In place of the current three-tiered dash, Honda’s wrap-around dashboard, ergonomic seats, and soft-touch or textured materials combine for a decidedly upscale impression. LX models come standard with an electric parking brake, LCD color audio system, and LED daytime running lights and taillights, but the EX-T’s 7.0-inch infotainment and 10-speaker audio system are excellent additions, especially with Android Auto and Apple CarPlay included. In between, LX-T vehicles improve on the base car’s equipment with a power moon roof, smart start and smart entry, and remote engine start. 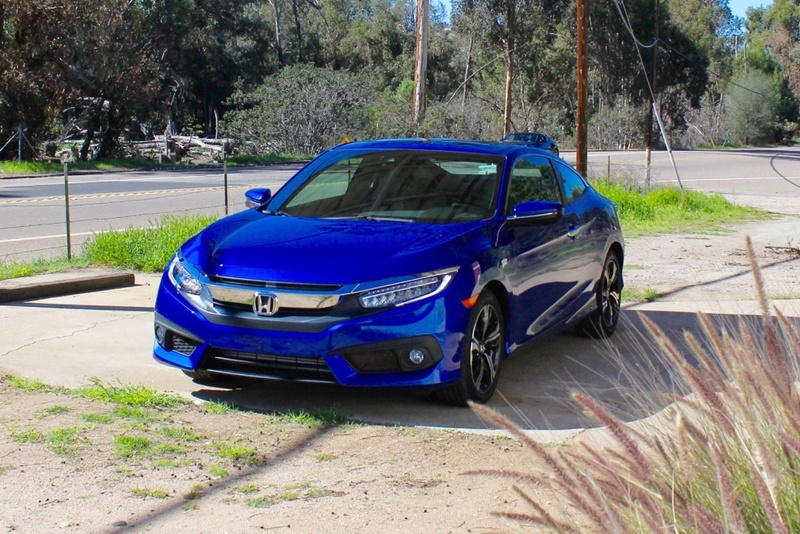 For those who want a luxury car’s technology without paying for pomp, the Civic Coupe Touring delivers Honda Sensing safety technologies, side mirror turn signals, rain sensing wipers, full LED headlights, Chrome door handles, and a Garmin navigation system. 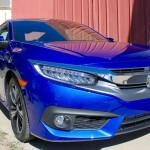 Honda’s Sensing system is worth the premium alone, as the combination of Adaptive Cruise Control (ACC) with Low-speed follow, Lane Keeping Assist, Road Departure Mitigation, CMBS (collision mitigation braking assist), Forward Collision Warning, and Lane Departure Warning add up to a cluster of semi-autonomous capabilities. Honda’s reworked display gauges also make an appearance in the coupe. The center readout is now fully digital, showing the speedometer, tachometer, and a customizable screen with controls for navigation, audio, smartphone, and vehicle settings. Masochistic compact car shoppers be damned – this is a fine cabin indeed. Honda is such a tease sometimes. 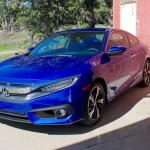 Experiencing the 2016 Civic sedan and its new ACE (Advanced Compatibility Engineering) platform was a breath of fresh air. The fun-to-drive soul of early Civics was back in a big way, but I helplessly longed for the Si version. Now, behind the wheel of the two-door variant, I’ve inched closer to the enthusiast derivative. Compared to the sedan, the coupe has stiffer suspension damping, increased spring rates, bigger wheels, and lower unsprung chassis weight. Another delicious appetizer – now must I beg for the main course? Sincerely, this new coupe is a joy to pilot. As with the sedan, Honda targeted European performance and handling standards for the two-door version. In many ways, it’s mission accomplished. 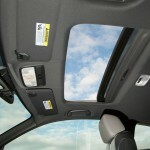 Steering is direct, braking is strong, and the new model has an empowering confidence to the way it navigates corners. Sure, I’d prefer more feedback through the steering wheel and I can’t name many European sport models with CVTs (Continuously Variable Transmissions), but this is an economy car, after all. 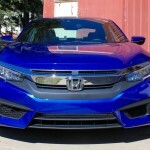 Powertrain options are ported from the 2016 sedan, meaning you can choose from 2.0-liter naturally aspirated four-cylinder with 158 horsepower and 138 pound-feet of torque or the right decision, Honda’s 1.5-liter turbocharged four-cylinder making 174 horsepower and 162 lb-ft of torque. For now, a six-speed manual is reserved for the N/A motor while turbo lovers must make do with the aforementioned CVT – the fairest thing about which I can say is that it’s not hateful. While fuel economy is the CVT’s main priority in normal drive mode, “S” gives the CVT a shot of espresso. 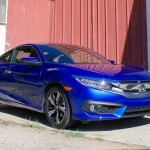 If you have the means to shop EX-T and above trims, you’re treated to a genuinely quick setup; Honda casually mentioned that the new coupe with its 1.5-liter turbo four is quicker to 60 mph than the current Si. 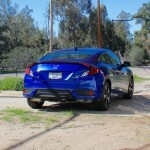 More good news: I may or may not have driven a turbocharged, six-speed manual-equipped Civic sedan test mule that will hit production this year. 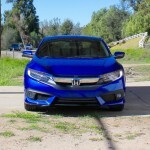 Honda has owned the compact segment, especially among 18-35 year-olds, for a decade now, and despite an inexplicable series of missteps early in the 2010s, the brand has shown no signs of forfeiting its crown. 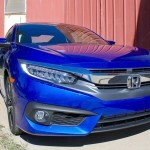 The 2016 Civic, which will include sedan, coupe, hatch, Si, and Type R variants before long, is without present equal. 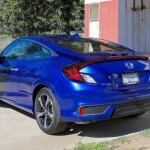 Though Honda has yet to announce pricing, when the 2016 Honda Civic coupe goes on sale in March, it will likely start just above the 2015 model year’s $18,290 figure. For reference, the 2016 sedan stickers at $18,640 in LX trim and swings up to $26,500 for Touring grade. 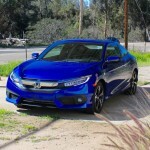 Styling, value, efficiency, and performance are packaged in a way that force rivals to vie for niches of the segment, rather than competing head-on with the latest Civic. While I may not quite match a Honda engineer’s ebullience, I can understand it. 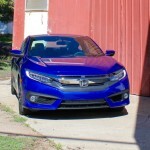 Some Honda enthusiasts enjoy sharing photos of their cars like the ones below. 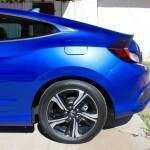 Sporty accessories and new 2016 Honda Civic Coupe parts can be shown in photos during upgrade projects.